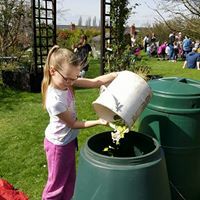 Bulwell Forest Garden is a community garden run by local residents. There are 25 communal growing plots, a wildlife area, sensory garden and community orchard. Volunteer opportunities Mondays, Wednesdays, Fridays and Saturdays, in gardening and conservation work. We hold a Lunch Club every Friday, where we harvest, cook and share a meal together as a community in our outdoor kitchen. We also deliver regular Family Environmental Play sessions, Adult Learning Workshops, Cooking Workshops and Community Events. Please note in Winter, we reduce our hours. Bus 17 "St Albans Road"
Austin Street is 5 minutes walk from both tram and bus. Entrance gate is halfway along Austin Street, next to house number 113..